A building contractor was constructing an extension on a house in Harrogate, North Yorkshire and they needed to lift steel beams into position. 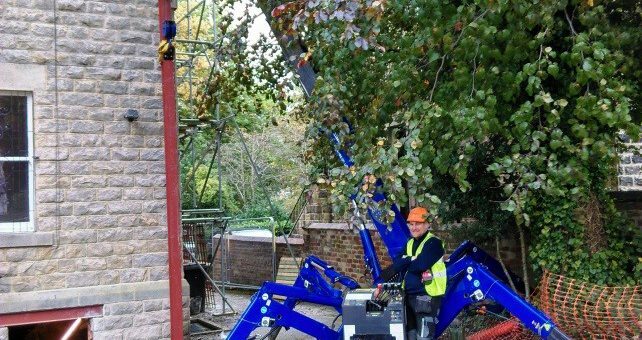 The access into the back garden of the property was down the side of the house with wet and muddy ground conditions meaning that a conventional crane couldn’t get into position. Not only that but the ground at the rear of the property was extremely uneven. This would need levelling for a standard crane to operate safely. The main contractor had carried out this sort of work before but had always had problems lifting the large components, pipework and valves into position and wondered if one of our cranes could carry this out for them. It was made more difficult by the fact that the pump room is inside so access was restricted to a single doorway and no diesel could be used as it was inside work. Lastly, as it was for the hospital any works on the system needed to be carried out in unsociable hours when the heating system could be shut down. Barrow in Furness football club were in the process of replacing the lighting stacks on their flood lights for night games. These are large stacks that need to be mechanically lifted into position but their location meant that a crane would have to drive over the pitch. A large wheel mounted crane would damage the pitch and just wasn’t suitable. A specialist firm required a large piece of truck mounted equipment lifting into place at height. Traditionally this involves the use of a large lorry mounted crane which is not cost effective for a relatively simple lift. A building contractor was tight on space and needed some steel beams lifting into position to support the roof of a new building they were constructing. A normal lorry mounted crane just couldn’t get into the site due to access restrictions. The firm were also concerned about health and safety and who could take responsibility for the lift on the day. A private home owner contacted Wobeck Crane Services for help with a new hot tub installation. The hot tub needed to be installed on the balcony of their home to enjoy on pleasant summer evenings. However, it’s cumbersome size and shape meant it couldn’t be manually lifted and the location of the balcony meant that a conventional crane would have damaged the garden. A specialist building company were building a new balcony on a house, space was restricted and they needed steel beams lifting into position. The beams were too big and heavy for manual lifting and space was too tight for a conventional crane. We were approached by a specialist crew who inspect bridges in rivers and canals. They needed to work in the middle of Leeds City Centre in the Leeds canal and they needed their boat lifting into (and out of) the canal so they could carry out their important inspection work. There wasn’t a suitable mooring point for the boat. The lift space was open but the location of the lift meant that the crane would have to be sited on historically significant stone flags that a large, wheel based, crane would have damaged.